VietNamNet Bridge - Hydropower plants along the Kon River have not helped to improve the area's economy as expected but instead have caused environmental damage. In order to fully exploit the terraced flow of the Kon River, the Ministry of Industry and Trade (MOIT) decided that 14 hydropower plants with total capacity of 312.1 MW will be built on it. These include 11 plants in Vinh Thanh district in Binh Dinh province. Vinh Son, which became operational in December 2004, was the first in the group of 14 plants. After that, the 9.9 MW Binh Dinh plant was built in Vinh Hao commune. In 2015 alone, the Kon River had four more hydropower plants, including Tra Xom with the capacity of 20 MW and Vinh Son 5 with capacity of 28 MW in Vinh Kim commune, Tien Thuan (9.5 MW) in Tay Thuan commune and Van Phong (6MW) in Binh Tuong communes of Tay Son district. Meanwhile, other hydropower plants are under construction, including Ken Lut Ha (6 MW) and Vinh Son 4 (18 MW). Analysts say when one new hydropower plant arises, hundreds of hectares of primitive forests will be cleared to make room for the plant. Hydropower plants along the Kon River have not helped to improve the area's economy as expected but instead have caused environmental damage. When the Tra Xom hydropower plant was built, for example, 633.8 hectares of the protective forests and the forestland in Vinh Kim and Vinh Son communes disappeared. The Tien Thuan hydropower plant ‘swallowed’ 90 hectares of the watershed forests in Tay Son district, while hundreds of primitive forests in Vinh Kim commune were cleared to get a site for Vinh Son 4 and Vinh Son 5 power plants. 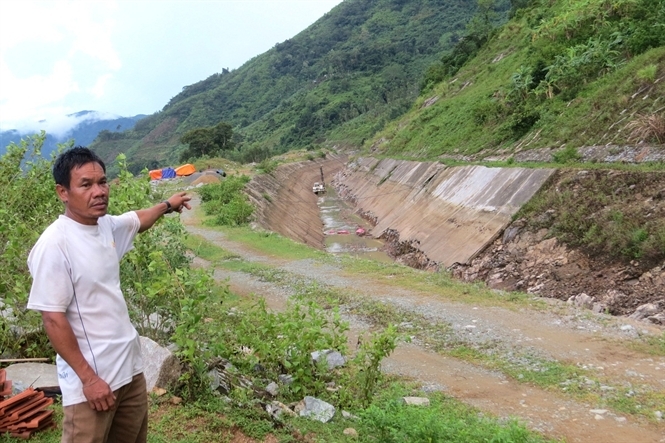 Tran Quoc Lai, chair of Vinh Thanh district, said people may think that a district so rich in hydropower plants (there are 11 plants in the locality) would have developed, but Vinh Thanh is still one of the 62 poorest districts in the country. “I think there is no other river like Kon which has to shoulder so many hydropower plants,” he said. “The hydropower plants has distorted the river bed. The primitive watershed forests have been eliminated,” he said. Meanwhile, the nature has ‘retaliated’ against people who cleared watershed forests and damaged the river. Most recently, people suffered heavily from the historic flood in November 2013. The flood came so quickly that even households in the highest land areas could not respond to emergencies. Twelve people were killed in the flood, while VND1 trillion worth of assets were lost. Since the forests have been cleared, they can no longer protect local people from floods and heavy rains.